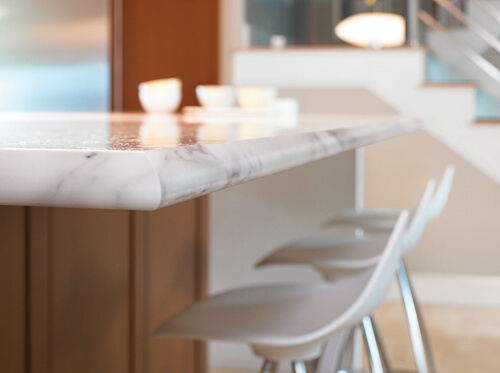 If I had metal edged countertops, I’d want to keep that look. However, the brown seam is an “authentic detail” I could just as well do without. 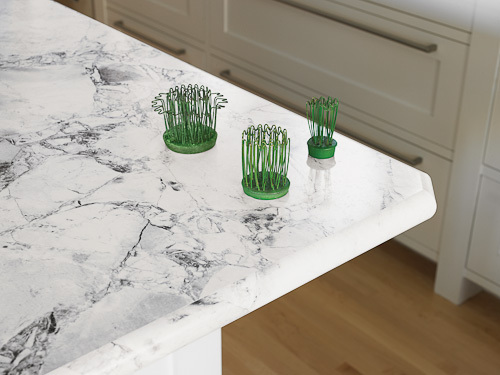 I think this innovation, in “marble” or other patterns that suggest midcentury…is a really nice option. My 2¢. Just a reminder that people have been “fauxing” marble for hundreds if not thousands of years. Even when marble was available it was a sign of wealth to be able to have an artist come faux walls and columns in their interiors. I’ve been in plenty of 19th century mansions where the owner could easily have afforded and acquired real marble yet chose to have it faux painted instead. 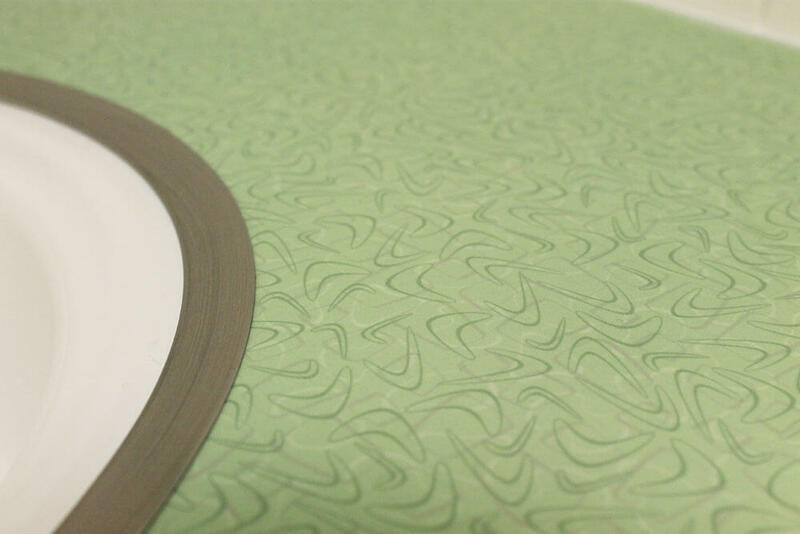 Laminate is just a 20th Century interpretation of an old idea. 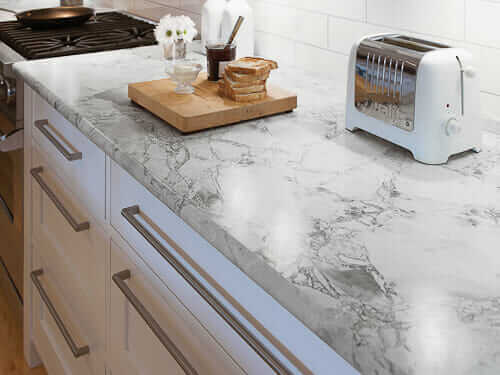 Faux marble Formica is just another choice. I’d imagine there was plenty of faux marble around in the mid century. 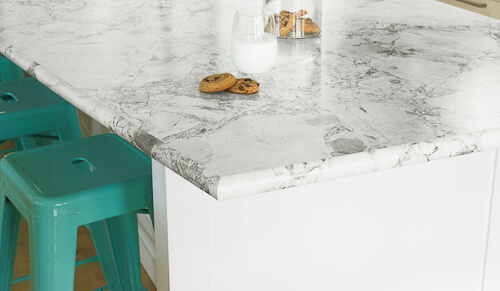 The “cracked ice” pattern of Formica has always seemed “marble-y” to me. The faux wood Formica on top of my work desk is living (sorry) proof of why it was so popular in the MCM days: the stuff is virtually indestructible, and the easy-care aspect of the faux was so appealing. Very cool! I did a bathroom of mine (vanity top and tub surround) in another material called Tyvarian that also mimics the look of real stone but is pretty affordable. Very interesting about the new edges. 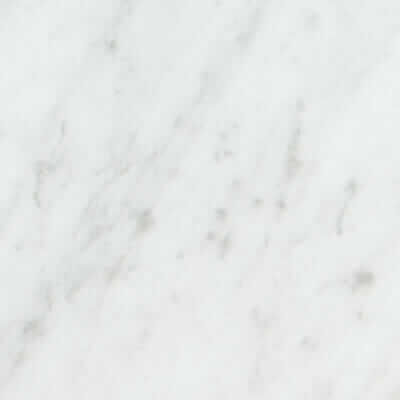 Right now I have a 12″ x 12″ sample of 180fx calacatta marble sample (#3460-46) from Formica. They sent if free with a request on their site. This Formica has a picture of marble so it really does look real. My guess is that is what is in some of the photos above. I keep looking at the sample to see if I would like it for for a bathroom remodel for one of my daughters. The house has been remodeled here and there and certainly needs the mauve 90’s torn out! 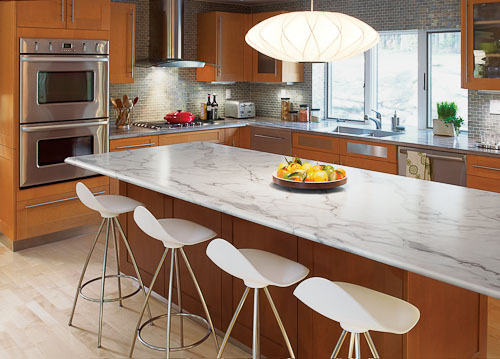 I too remember marble laminate as a choice for a home I had in the early 70’s. I did not choose it, but some of my friends did. 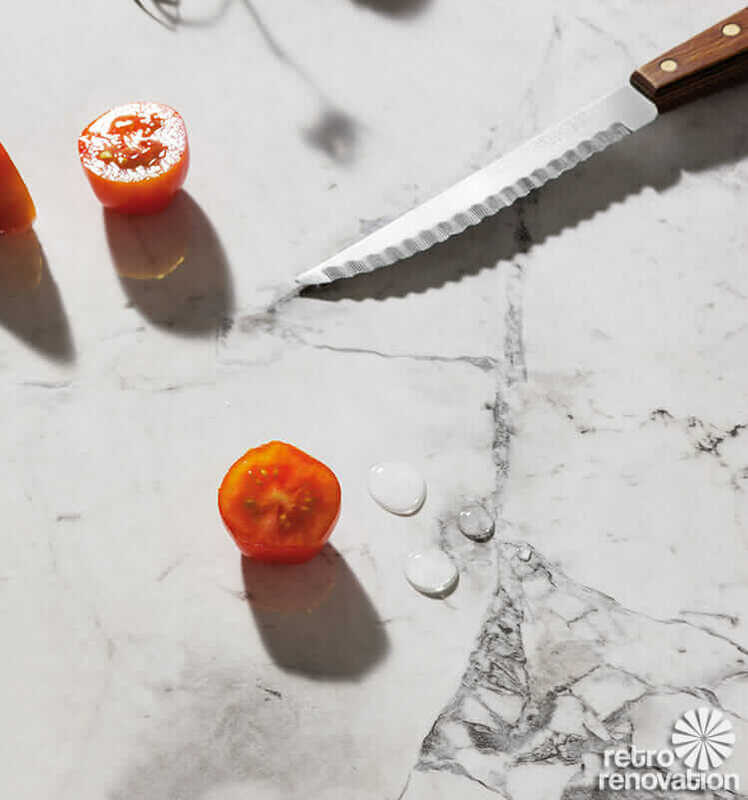 The calacatta marble looks a lot like carrera marble to me. 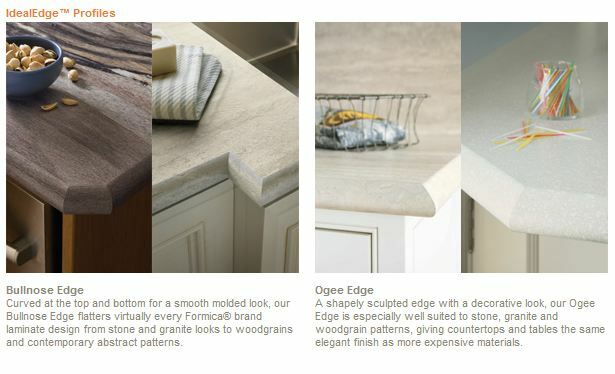 I would love to know what the prices would be for the new edges. I was in Lowes last week and there was no one around that seemed to know any prices about any counters! 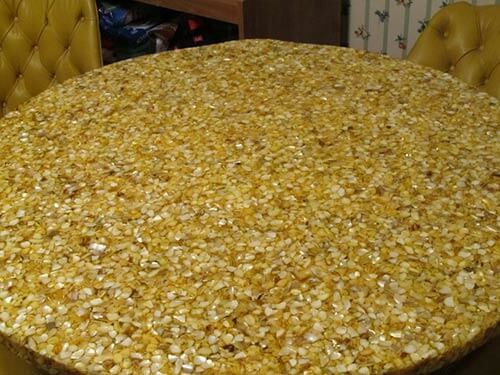 At the time I was not aware of the new edges for formica. I think the faux marble would look great with a drop in sink. I think this would look nice, be easy to keep up, and maybe not be too expensive. 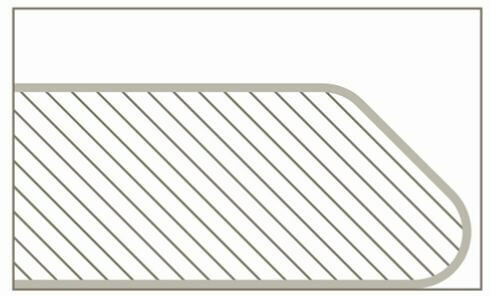 Thank you for alerting us about the new edges! Love that pretty Dualit white toaster and the bright green hairpin frogs (for flowers) on the counters.